Often when I'm researching online, I lose hours and hours just browsing documents. It's always interesting and once in a while I find things relating to what I was looking for in the first place. Most often though, I find things that take me on a completely different path. 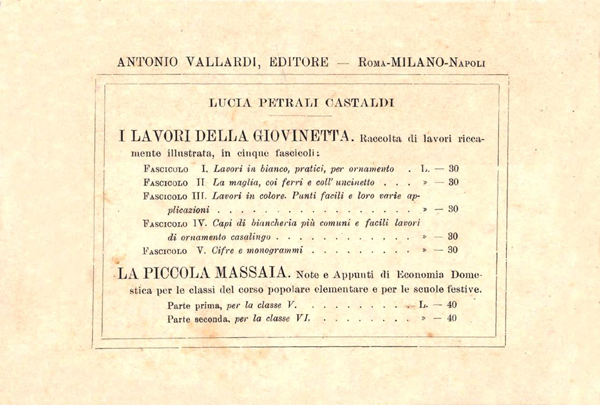 I started out looking for something on the Universal Exposition of Turin in 1911 and ended up discovering that the Internet Archive has some scanned copies of old Italian Almanacs from the beginning of the 20th century. These are fun to browse through for the photos and advertisements if you don't read any Italian. They are like mini-encyclopedias and re-caps of the news of the past year and the events for the next year. Sometimes there are pages of summaries of other articles from previous issues which send you on your way to check out something you missed. Key words are: moda = fashion, lavori femminili = women's work, ricamo/i = embroidery/ies, trina/e or merletto/i or pizzo/i = laces. The accompanying article is brief and talks of the many different types of embroideries and laces and of the expositions of Siena, Turin and Paris. The author expresses a desire for more of such exhibitions in Italy "so that women can be encouraged to exercise their inventive faculties, and show what their intelligence is capable of producing." Uh, oh... how did we get to "Milan" when I started out in "Turin"? See how it happens? How easy it is to get distracted by beautiful things?! Ah! Let me think about this Punto Sforza for a bit and let's see if something comes back to mind. In the meantime, have a browse through the old Almanacs for a bit of early 20th century Italy flavour. I have long been an admirer of Puncetto needle lace from the Piedmont region of Italy. Every once in a while, I take out my needle and thread and try to practice what I learned in two short hours of lessons at the 2009 Italia Invita Forum in Parma. In May of this year there is even a 12 hour workshop available at the next biannual Italia Invita event to tempt me. 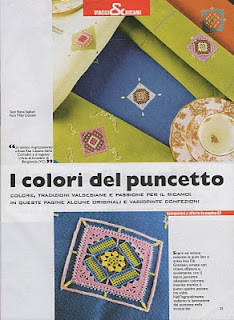 While I wrestle with the decision of whether or not I can attend this workshop, I want to tell you about some special ladies who create beautiful coloured Puncetto which I first saw in a RAKAM magazine in March of 2008. 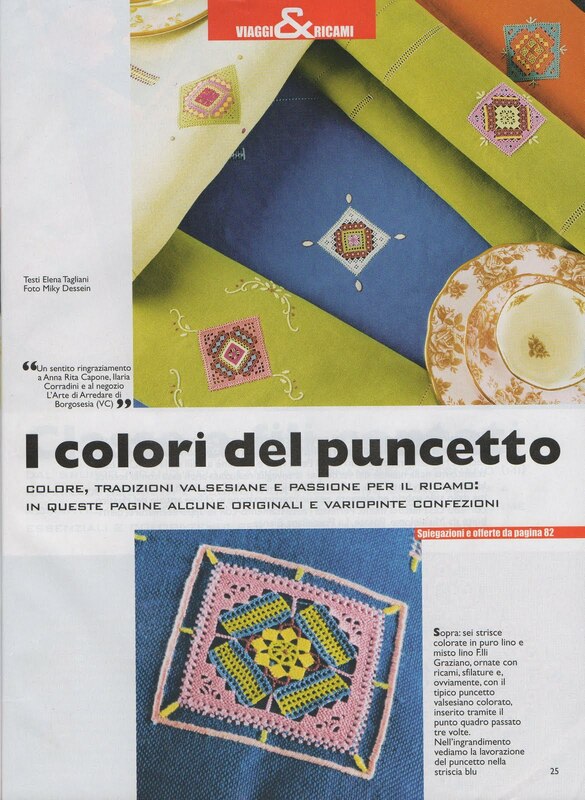 Last year there was another article about them in the April issue of Ricamo Italiano magazine. Anna Rita Capone keeps a blog which I recently discovered with lots of pictures of her adventures with her maestra Ilaria Corradini. The work is exquisite and the blog worth going through and looking at all her posts for each and every delightful and imaginative design and project. Anna's latest Puncetto pieces have been single colour and she seems to be doing the work on commission so she doesn't have a choice in the colours but even the tone on tone pieces are beautiful! What I wouldn't give to be able to execute the work these ladies do! In Italy in the spring of 2009, DMC re-released the thread they call Retors d'Alsace or Alsatian Twist. It is available in two weights, no. 8 and no. 12 - similar to Pearl Cotton but twisted more and slightly different in thickness, and comes in 82 colours for the no. 8 and 65 colours for the no. 12. DMC states it is suitable for embroidery, cross stitch, crochet and lacemaking. The skeins are 20 grams each and sell for around €4,20 which is about $5.60 USD using today's exchange rates. The thread is made of Egyptian long staple cotton which has been mercerized twice - this makes it both strong and shiny. Retors d'Alsace is made at DMC's plant in Mulhouse in the Alsace region of France. DMC's Italian website says it is the return of a thread they made in the early 20th century. I looked in the back of my Italian 1926 copy of L'Uncinetto (Grosso Uncinetto) from the DMC Library [Grosso Uncinetto is Large Crochet in Italian] and I found a listing of Retors d'Alsace threads in weights ranging from 5 to 100! I don't know when they stopped producing this lovely thread. If you search around on the internet, you can find some old spools of different weights of Retors d'Alsace, there are quite a few no. 50 weight ones here. At the Italia Invita Forum of 2009, DMC had an impressive area to display their wares complete with stitched pieces from the old DMC Library of booklets. They were giving out samples of the "new" Retors d'Alsace. If you'd like to see what their display looks like when they visit shows in Italy, check out their blog. 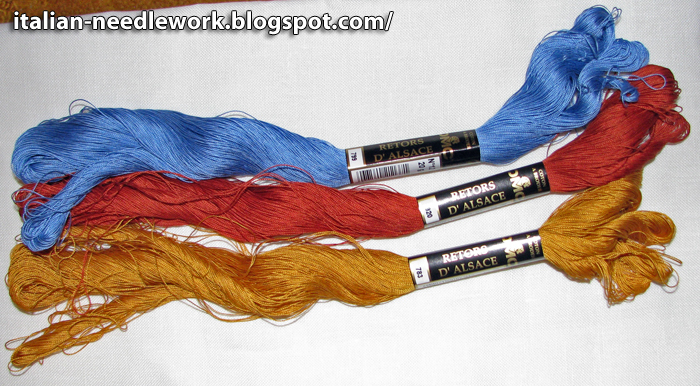 Mary Corbet over at Needle 'n Thread did a review of Retors d'Alsace if you'd like to take a closer look. Retors d'Alsace is widely available only in Italy. DMC had plans to distribute it in other European countries - but last I checked, it still wasn't even available in France! 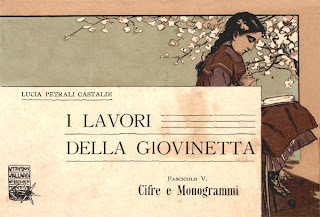 I recently purchased this little booklet written for young women c.1906 by Lucia Petrali Castaldi who would later (1925) become the editor of the Mani di Fata embroidery magazine and an accomplished author of many other texts. There are 18 pages in total: four complete alphabets, four pages of examples of how to arrange monograms and ciphers, some images of other embroidery types which might compliment work with a monogram and a few words of wisdom. 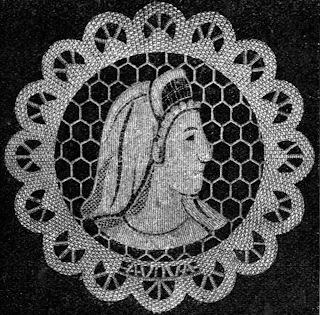 "Women and girls of good sense find it necessary to mark their linens, both personal and household, with their own initials or with their whole name. On this point they are all in agreement: the differences begin with all the different ways to mark your linens. There are those who prefer something quick and adopt only one cursive initial - that of their last name - embroidered in Stem or Chain Stitch, when not resorting to the rapid, horrible stamping of indelible ink. They are practical women with little patience, always attracted by other treatments which do not require the measure of movements and tranquility of person. Some women prefer the traditional markings - on each piece - made with the no-less traditional Backstitch in red cotton: they are precise women, a bit limited, devoted to the past: they are never in a hurry and do everything the way one should. Finally, there are women - real ladies - even if their purse is more than modest, meager, with brilliant views of educated taste. 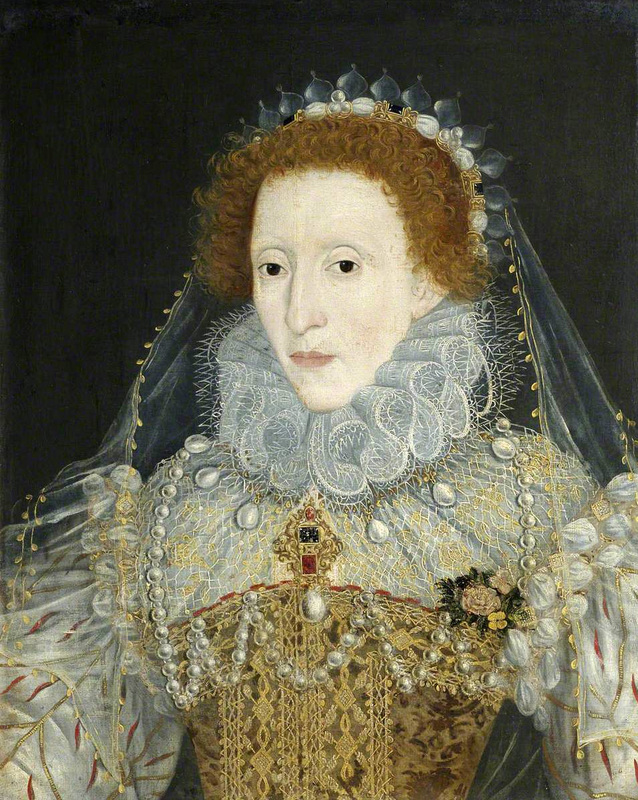 They known to adopt, when appropriate, one or another of the various techniques and use them with finesse: although breathless from their daily tasks, they know how to find the time for so many beautiful works: beautiful not in material wealth, but in the good taste of choice and execution. Well prepared monograms executed with skill, with the right effects of chiaroscuro, immediately give the idea of the completely personal and innate taste of the woman who chose them." A design for around a buttonhole on a man's shirt. 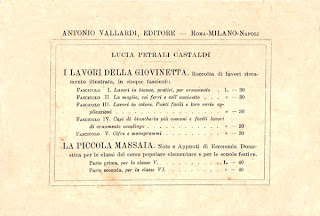 You can read more about Lucia Petrali Castaldi on the Tuttoricamo website: click on the British flag for the English version then "Prominent Characters". I have been occupied elsewhere lately but things are slowly returning to normal and I will get back to posting regularly soon. If you have emailed me, please be patient awhile longer, I will answer you eventually, there are many messages and only so much time to answer them. 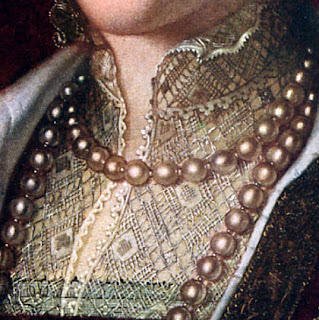 It has come to my attention that some readers were confused as to the actual needlework technique of Mezza Mandolina and I realize that if you don't ever click on the links in the post, you will never know that it is a knotted netting. Let's clarify a couple of things. First, if you see some words in a different colour than the rest of the text of the post or if it is underlined, that means you can click on it to go to a different website to see related photos or articles. 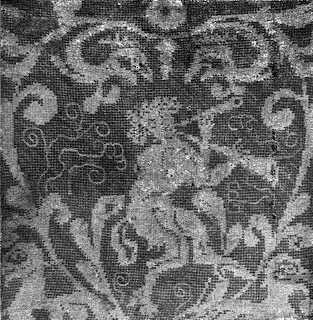 Second, Mezza Mandolina in the post I wrote is a knotted netting technique similar to the netting made for Filet Lace (also called Lacis or Modàno). 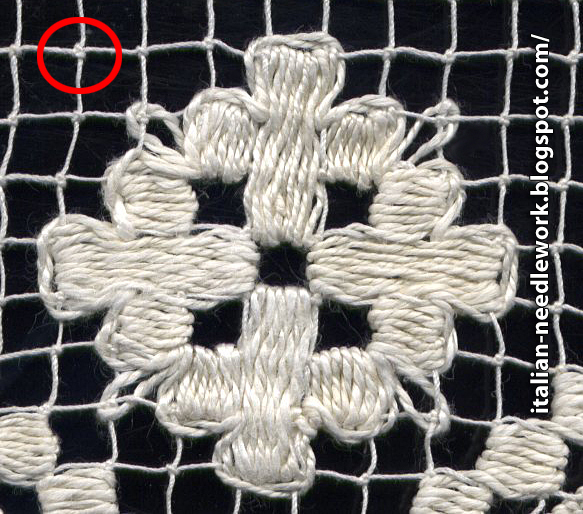 Have a look at Therese de Dillmont's Needlework Encyclopedia book online to understand how knotted netting is made. There is also some history of Filet Netting here. Back to Mezza Mandolina. As far as we understand from the old texts and painted portraits, Mezza Mandolina was made in the same way as Filet Lace, that is, it was a knotted netting which was then embroidered or not. 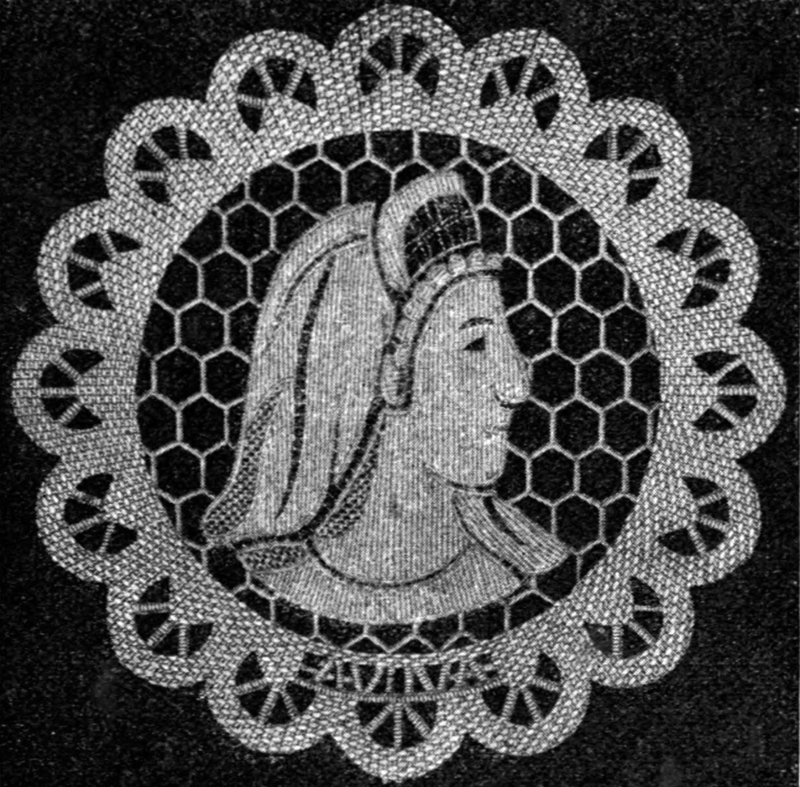 Instead of making even rows of square meshes as in Filet Lace, Mezza Mandolina had several meshes which were bigger or smaller according to different patterns. 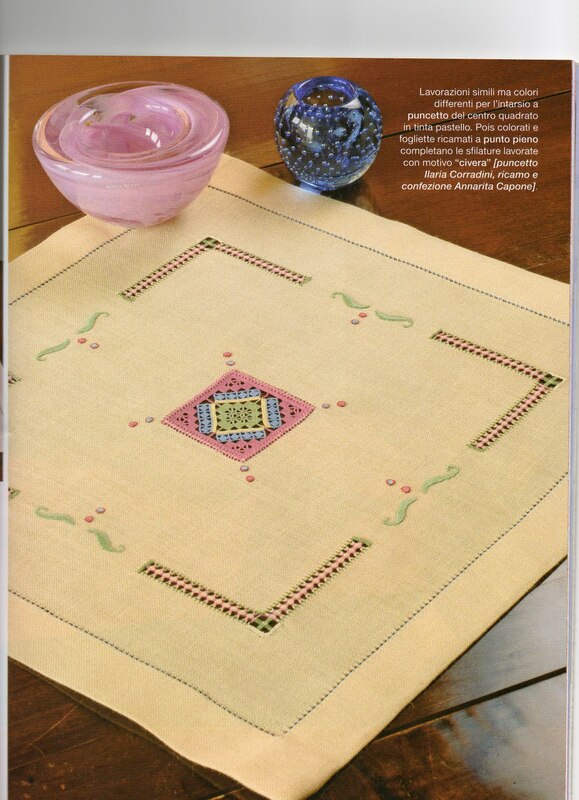 Interestingly, I have been told of a different technique which was also called Mezza Mandolina, done while weaving traditional Buratto fabric in Tuscany. As soon as I have some information on that, I will post it. I hope this clears up some of the confusion regarding Mezza Mandolina. Please leave a comment below if I haven't answered all of your questions. Have a look at this website for the author's adventures in recreating Mezza Mandolina. If you want to try it out, here are some tutorials. Or go here for Enza Termini's adventures in recreating Mezza Mandolina in Italian (click on the heading: Mezza Mandolina).